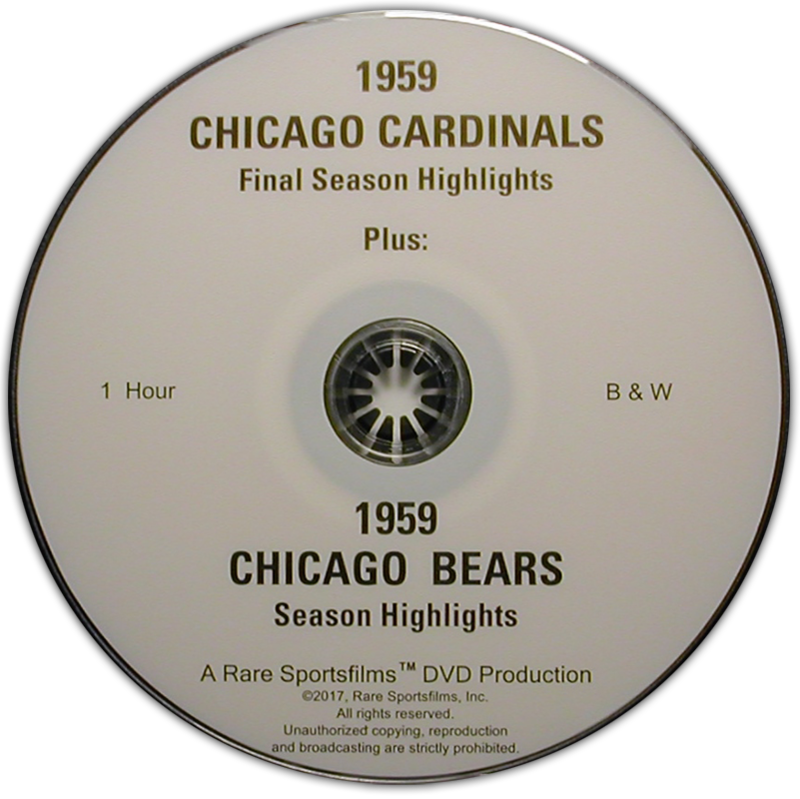 The 1959 Season Highlights of the Chicago Cardinals and Chicago Bears are now both available on one DVD for the first time ever! Thanks to the film restoration expertise of Rare Sportsfilms, Inc, Chicago fans can now go back in time and once again watch their NFL heroes from 1959 in action on this new 1-hour, B & W DVD! Both films are presented by Falstaff and even include the original Falstaff Beer cartoon commercials featuring "The Old Pro" and his huge sidekick "Elwood"! Joe Boland narrates the Cardinal film, while Jack Brickhouse narrates for the Bears. Under second year head coach "Pop" Ivy, the Chicago Cardinals were again a dismal football team in 1959. General manager Walter Wolfner, knowing ownership was considering moving the club out of Chicago because of poor attendance, scheduled two home games at Met Stadium, Minneapolis! The team had already left aging Comiskey Park and would be playing its other four home games at Soldier Field in '59 (the Bears were still playing at Wrigley Field in those days). Alas however, this would be the final season in Chicago for one of the NFL's charter members, as. the club would soon start the decade of the '60's in St. Louis! Players you'll see on this last Chicago Cardinal team include QB's King Hill and John Roach, Joe Childress, Ken Hall, Woodley Lewis, Sonny Randle, John Tracey, Carl Brettschneider, Jimmy Hill, Night Train Lane, Jerry Norton, Billy Stacy, Bob Cross, Dale Meinert, Don Gillis, Leo Sugar, Ed Husmann, Ken Panfil, Frank Fuller, Bobby Joe Conrad and John David Crow. Meanwhile, the crosstown Bears had an excellent 8-4 season in '59, finishing runner-up to the World Champion Colts in the Western Conference, and beating out the improving Packers of new coach Vince Lombardi. After starting out only 1-4, the Bears then won their last 7 in a row! Players shown include QB's Ed Brown and Zeke Bratkowski, Willie Galimore, Johnny Morris, Rick Casares, Jim Dooley, Will Dewveall, Harlon Hill, Bill McColl, John Aveni, Joe Fortunato, Bill George, Larry Morris, Erich Barnes, J.C. Caroline, Richie Petitbon, Doug Atkins and more! Sun. Sept. 27 - Cardinals 49, Redskins 21 at Soldier Field, Chicago. Sun. Oct. 25 - Eagles 28, Cardinals 24 at Met Stadium, Minneapolis. Sun. Nov. 1 - Cardinals 45, Steelers 24 at Soldier Field, Chicago. Sun. Nov. 22 - Giants 30, Cardinals 20 at Met Stadium, Minneapolis. Sat. Oct. 3 - Bears 26, Colts 21 at Memorial Stadium, Baltimore (night game). Sun. Oct. 25 - 49'ers 20, Bears 17 at Kezar Stadium, San Francisco. Sun. Nov. 1 - Bears 26, Rams 21 at The Coliseum, Los Angeles. Sun. Nov. 29 - Bears 31, Cardinals 7 at Soldier Field, Chicago. Sun. Dec. 6 - Bears 27, Steelers 21 at Wrigley Field, Chicago.